Ah! Reno at long last. Actually it's been only a few hours, what with the good traffic and better music. Still, I'm hungry, although from what I'm not really sure. Just breathing the dry air, I suppose. We turn off the highway, heading towards the man drag. It's amazing to me how quickly desert becomes urban. 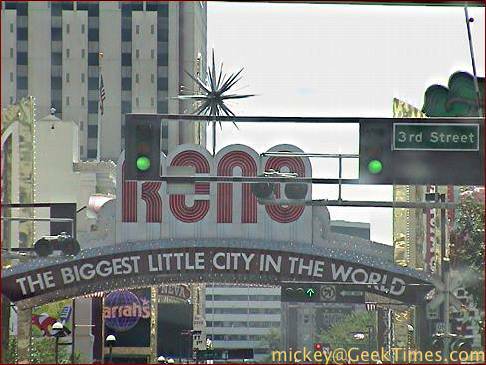 Reno really is a little city. It weirds me out every year. One main street, a few cross-streets, a bit of infrastructure, desert. If you're not part of the gambling engine you're nowhere. 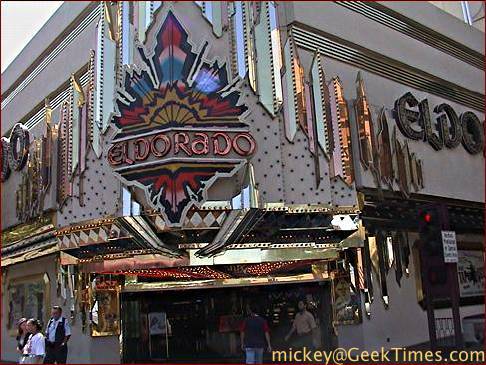 Leaving the worries of the denizens of the real world behind, we arrive at the El Dorado, home of my favorite Reno buffet. There are others, and we ought to have a comparison some day, but I never want to spend the time on this travel day. Perhaps if I travel back to Reno during the year... For now, we return to Old Faithful. We eat. Well. It's good and plentiful. Then we continue playa-bound, stopping only for a few chores before leaving Reno.